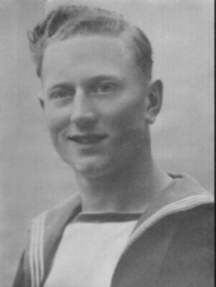 Able Seaman E. F. (Frank) Wardle, who served aboard HMS. Vengeance with his twin brother Arthur Wardle, until 29th January 1945. 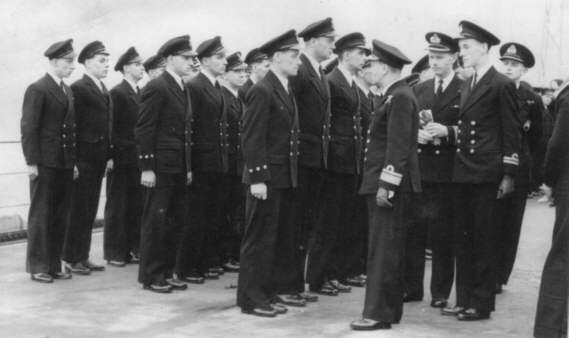 Rear Admiral Harcourt in Charge of Fleet, with Captain D. Neame and Lt. P. Lock inspecting the Chief Petty Officers and Petty Officers on HMS. Vengeance at Greenock, Scotland on Sunday 11th March 1945. 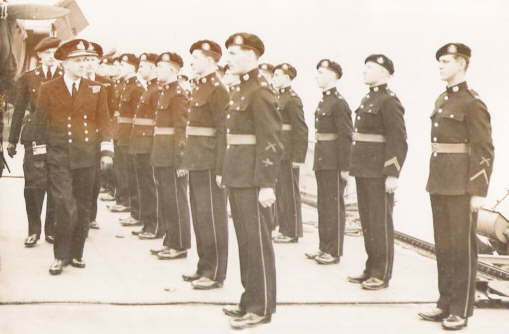 Rear Admiral Harcourt, inspecting the Royal Marines on HMS. Vengeance at Greenock, Scotland on Sunday 11th March 1945. 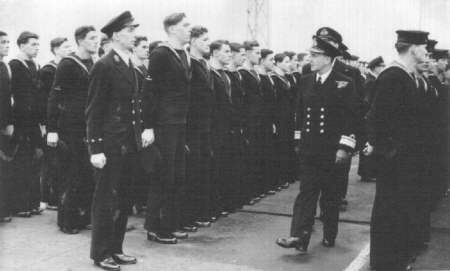 Rear Admiral Harcourt inspects the ship's company on HMS. Vengeance at Greenock, Scotland on Sunday 11th March 1945. Torpedoman Reg Warner (back row 2nd l to r). 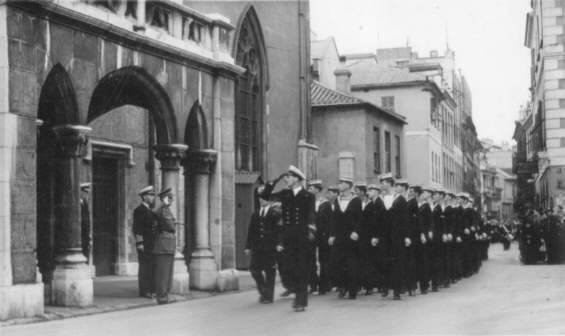 Ship's company marching past Admiral Crutchley on the flight deck of HMS. Vengeance at Gibraltar. 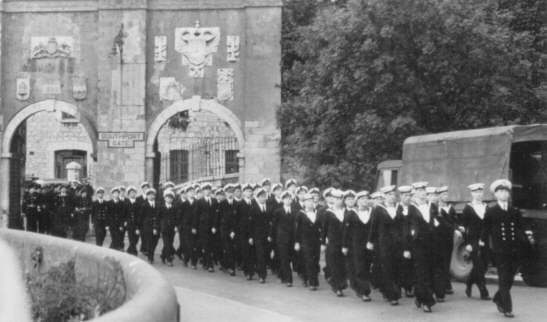 Royal Marines marching past Admiral Crutchley on the flight deck of HMS. Vengeance at Gibraltar. 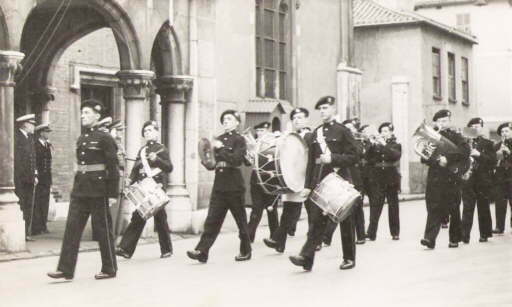 Royal Marines Band from HMS. Vengeance lead the procession through Gibraltar. 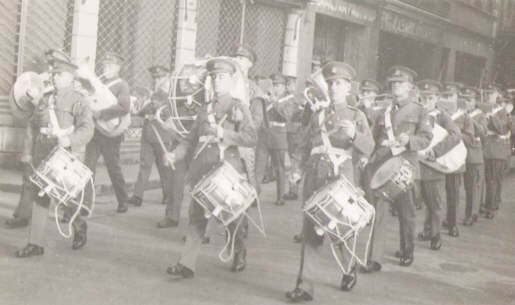 Parade in Gibraltar. Lt. Cdr. 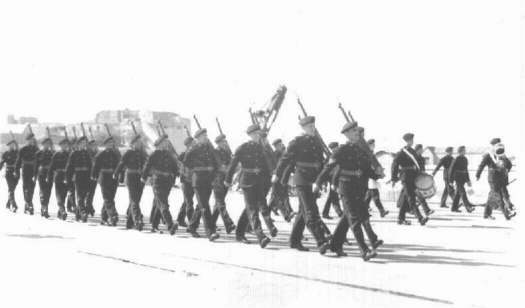 Wood (Gunnery) leading parade, followed by Lt. Cameron. Lt. Gen. Eastwood (taking salute) with Captain Neame and Admiral Crutchley. 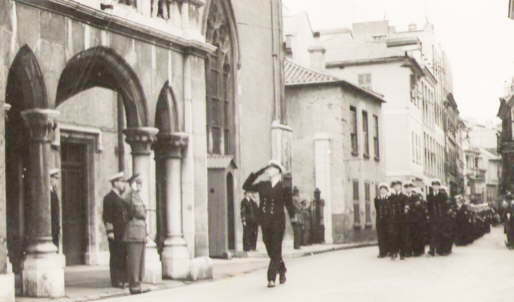 Parade past the Governor of Gibraltar's Office by the ship's company of HMS. Vengeance in 1945. Royal Marines Band passes the Governor of Gibraltar's Office. Royal Marines march past the Governor of Gibraltar's Office. 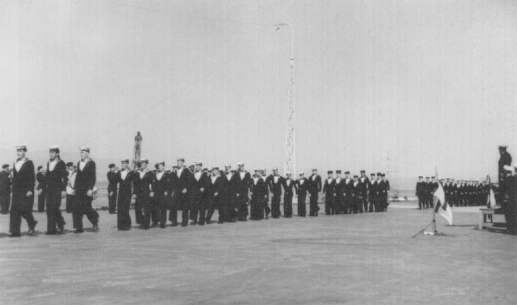 'B' company of HMS. 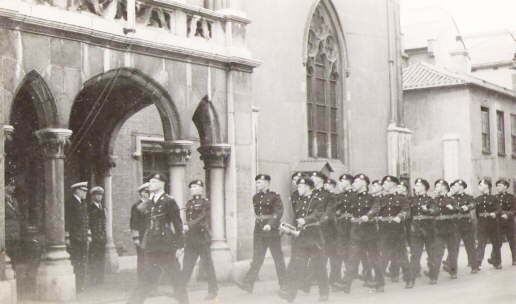 Vengeance marching through Southport Gate, Gibraltar in 1945. Lt. Locke (Torpedo) is leading.